Delicious and simple. I changed the garnish a little bit and used walnuts and feta cheese. Very important to season well at the end (salt, pepper, and good fruity olive oil) otherwise the soup can taste very bland. With the correct seasonings the favors really pop. easy, no change to recipe, tasted great, big hit with friends. on my list of favourites. There's not much new about this recipe, but it's nice enough. From the star of the FOX Network's exciting new reality show Hell's Kitchen quick and easy recipes for the home cook. 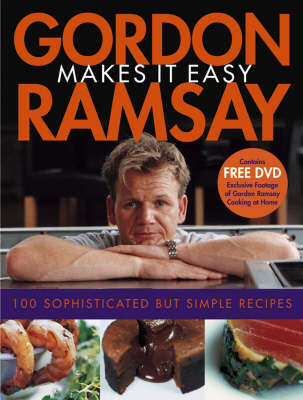 International superstar chef Gordon Ramsay scored a huge hit in the U.K. with his television show Hell's Kitchen, which showcased both his formidable cooking skills and his infamous temper. Now this three-star Michelin chef is poised for big success on this side of the Atlantic, with the arrival this spring of the U.S. version of the show and a tie-in cookbook, In the Heat of the Kitchen. His latest book, Gordon Ramsay Makes It Easy, is his first geared specifically to the needs of the home cook, with simple, accessible recipes that take very little time to make. A smart design and 200 color photographs complete a striking full-color package that has terrific gift potential as well as everyday cooking appeal. Gordon Ramsay (London, UK), with eight restaurants, is Britain's most highly acclaimed chef and restauranteur and the only London chef to have been awarded a three-star Michelin rating. He is also the author of In the Heat of the Kitchen, Gordon Ramsay: A Chef for All Seasons, and Gordon Ramsay's Just Desserts. His other hit U.K. television shows, Ramsay's Kitchen Nightmares and Ramsay's Boiling Point, recently aired on BBC America.